I am looking at the white question of the screen, as our cat Roshi bows at the scratching post and sharpens his claws, and as the wind runs its fingers through the leaves of the fading magnolia outside. I am wondering how I can make you happy. I have been thinking about offerings. That beautiful word. 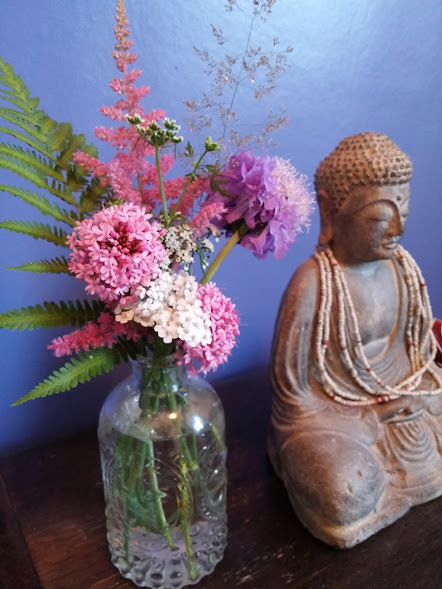 Every week Kris circles the temple garden and chooses flowers for the shrine; pyramids of frilly scented lilac, branching cow parsley, frothing ferns, buttercups like solid drops of blackbird-song. At the start of every service we make offerings — lighting a stick of Japanese incense and letting the smoke loop out, carefully pouring water into three pale bowls and lifting them up to the Buddha. I have been wondering how it might be to live my whole life as an offering — to the Universe, to those I love, to the Buddha. If I did that, what would I do with my days? What would I write? What do you want from my writing? How can I make you happy? ‘How can I make you happy?’ is a question that triggers my codependency, my urge to people-please. How can I manipulate you into liking me? What will be popular? What will collude with your favourite stories about yourself? What will give you a sugar-kick? I don’t want to put flowers on the Buddha’s shrine to curry favour. He/she loves me anyway. I want to offer flowers because it makes me happy, and to say thank you, as I have already received so much. When I was ordained as a Buddhist priest, I was given my new name by someone who loves me. She called me Satyavani — Satya means ‘truth’, and ‘vani’ means eloquent communication. It both describes what I do, and inspires me to do it better. I was just interrupted by the trill of my mobile phone, alerting me that my brother has sent a fifty second video of him and his family on holiday. A big blue pool dappled with light, a giant inflatable flamingo, my little niece with her bright pink armbands. Shouting. Laughter. I can offer you this — the instinct my brother had to share a little slice of his life with me. I can show you my pleasingly heavy glass dome with a sparkly jellyfish inside, and how it dances with the light. I can tell you about how tired I felt this afternoon after a week of too-many-people, and that after my nap I felt like I was pushing up from deep deep underwater. I haven’t quite breached the surface. I want to tell you the truth. I want to offer it to you with open hands. I want to place precious things on this shrine of white pages. I hope that sometimes my words might serve the same purpose that they offer me — turning me towards love. Always towards love.